“We have implemented Engineering the Future in our high school during the past two years to rave reviews from students, parents, and educators. The focus on the design process, which ties all of the activities together, provides the students a common set of steps to help lead to success." Introduce students to the world of technology and engineering. Engineering the Future (EtF) is a set of high school modules that can be taught as a one-year course or as four eight-week projects. Leaders in many states and districts have recognized that job prospects for students in engineering, technology, and allied fields are already strong and growing rapidly. Consequently they are looking for affordable curriculum materials to strengthen engineering and technology education at the high school level. Engineering the Future has been designed to meet that need. 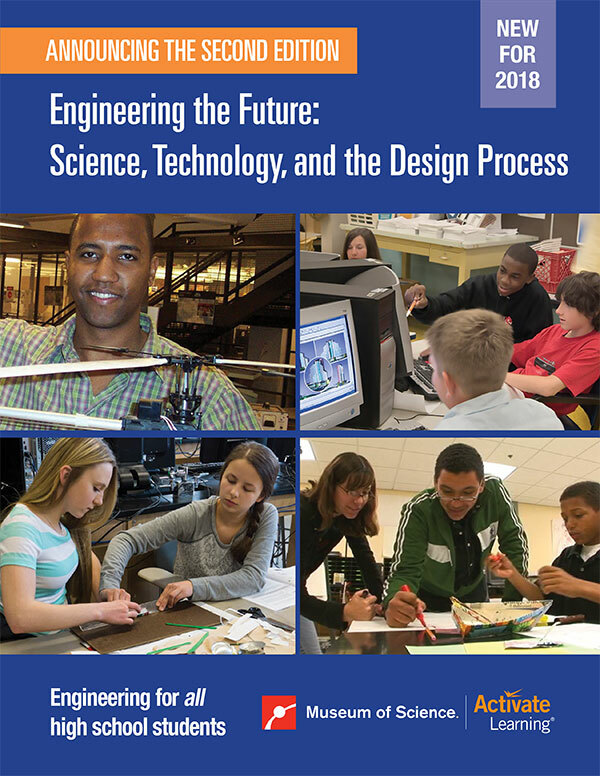 Engineering the Future: Science, Technology, and the Design Process is a set of four design-based project modules, which can be taught as a one-year course or as four eight-week projects, that introduce students to the world of technology and engineering. Through practical real-world connections, students have an opportunity to see how science, mathematics, and engineering are part of their every day world, and why it is important for every citizen to be technologically and scientifically literate. A remarkable aspect of the new science standards has been the explicit inclusion of engineering and technology within science, not just as a means for better communicating science, but also as a means for helping students develop problem solving skills. A complementary change is that the National Assessment of Educational Progress (NAEP), also known as The Nation’s Report Card, has added an assessment of Technology and Engineering Literacy (TEL), in addition to the semi-annual assessments in mathematics, reading, and science. In 2016 the National Assessment Governing Board released the results of the first TEL assessment with a nationally representative sample of 21,500 eighth graders. Findings were that only 41% of boys scored at the proficient level or above, while 44% of girls scored proficient or above. These findings indicate that our students still have much room to improve, and also that girls are outperforming boys in some areas. Engineering the Future can provide the kinds of learning opportunities that all students need to achieve technological literacy. Introduction to Engineering. Placement of this course in the first year of high school opens students to career interests that would otherwise have lain dormant. The early hands-on maker approach to integrated engineering and science serves to inspire future interest in later sciences and engineering courses, opening a door for those who wish to enroll in technical studies at a college or university. Physical Science Foundations. The course can be used as the foundation of a project-based course in physical science, integrated with engineering design. Given the large number of physical science standards that are the focus of these activities, some of our pilot teachers testing the second edition have received approval to consider EtF to be a fully credited physical science ninth grade course. Capstone Course. Engineering the Future can serve as a capstone course for high school juniors or seniors to apply all that they learned in high school to practical situations, ranging from science and math, to history, social studies, communication—even art and music. The course can also provide an excellent introduction to the fields of engineering for students who are considering technical careers. 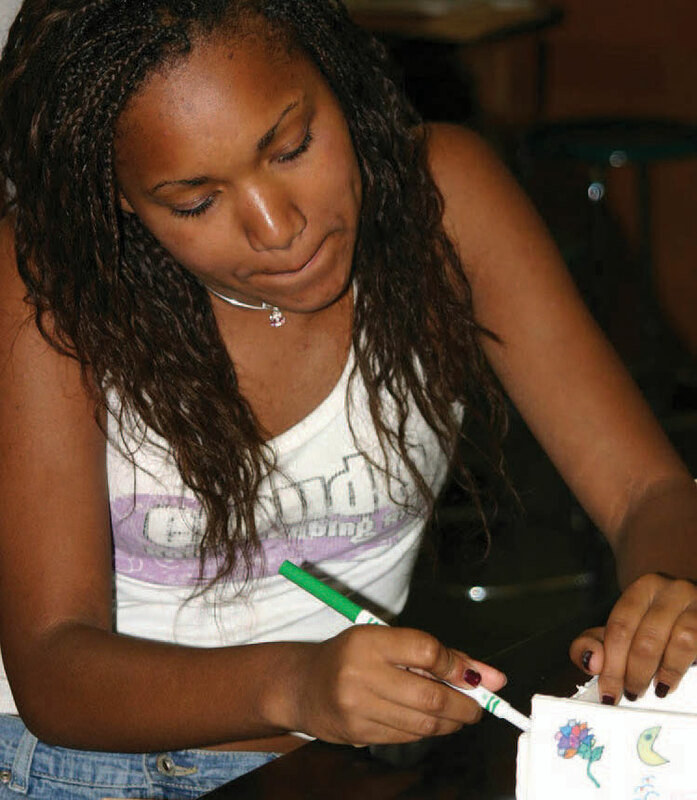 Summer and After-School Programs. Given the “maker" approach aspects of instruction, and high priority on activities that engage students’ creativity, these projects could also be useful in a STEM after-school or summer program. Engineering the Future should not be considered in isolation, but as one step in a sequence of courses that students take as they progress through high school. When students complete this course, they will have a broader understanding of the wide variety of technical careers that are open to them. Some students may wish to take more courses in science or math or more specialized courses in technical fields. However, not all students will wish to become involved in science and technology as careers. By providing alternative sequences, students will have opportunities to choose pathways that are consistent with their current interests and desires while keeping open their options for the future. 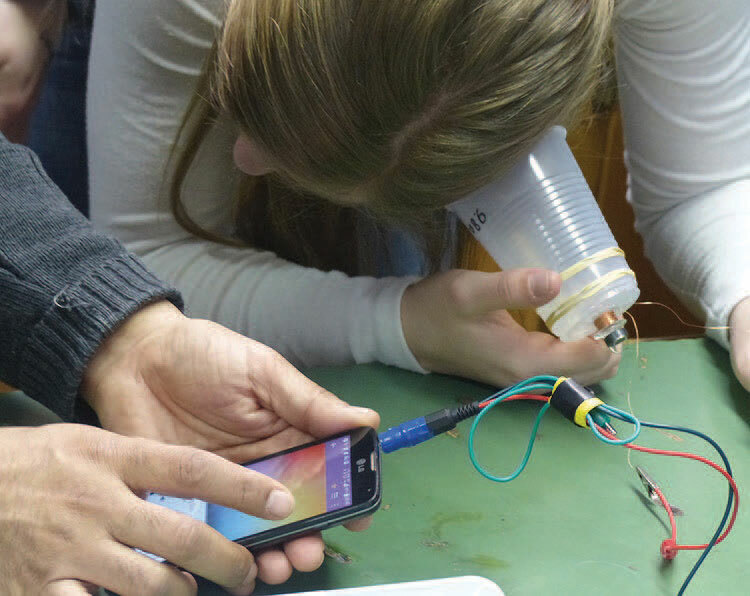 Jump Into Engineering engages students with a creative design project—to invent a mobile device accessory—on the first day. Later students learn the more systematic engineering design process. 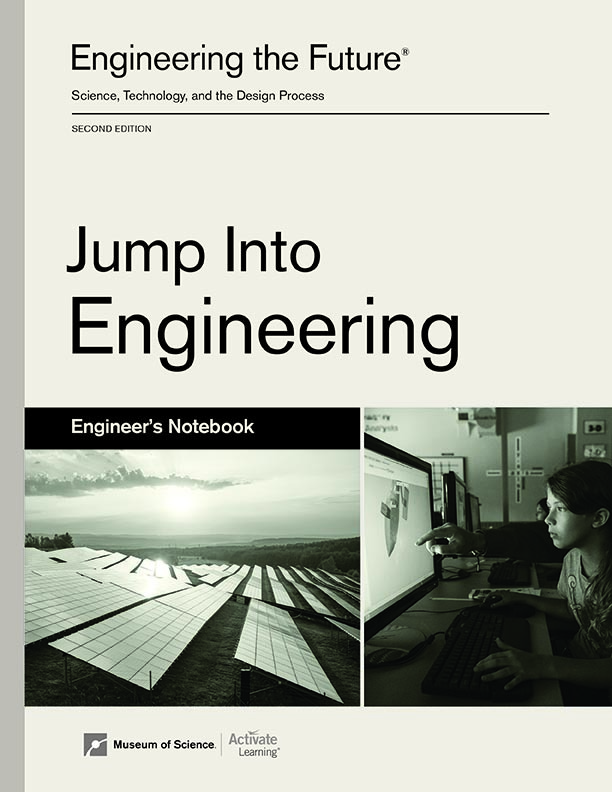 As in the prior edition, students learn to make orthographic and isometric scale drawings to develop skills in translating observations into mental models, which is the essence of “looking and drawing.” Building on successes from the maker movement, we expand on this in the second edition by adding 3D Computer Aided Design (CAD). Students utilize CAD in a more authentic design process for the major project, to design an organizer to meet the needs of end users based on a survey that the students plan and conduct. The students select materials, create a CAD model of their design, and conduct a life cycle analysis and peer review, among other tasks. Design a Green Building emphasizes building systems, such as mechanical, electrical, environmental, which students investigate one at a time, then later integrate into a model. In the second edition, students have open design choices for the building that they choose to develop, with an emphasis on understanding the needs of their community from a “smart growth" perspective. They use that as input to the engineering design process. As in the prior edition, students conduct experiments on various physical properties of materials, such as strength, elasticity, and thermal conductivity, to build skills in lab procedures and develop a hands-on understanding of various materials and their uses. In the later part of the project, given their experience in the prior project with digital CAD technology, students are able to use CAD to develop floor plans and an overall structure for their building with powerful visualization of the final designs. 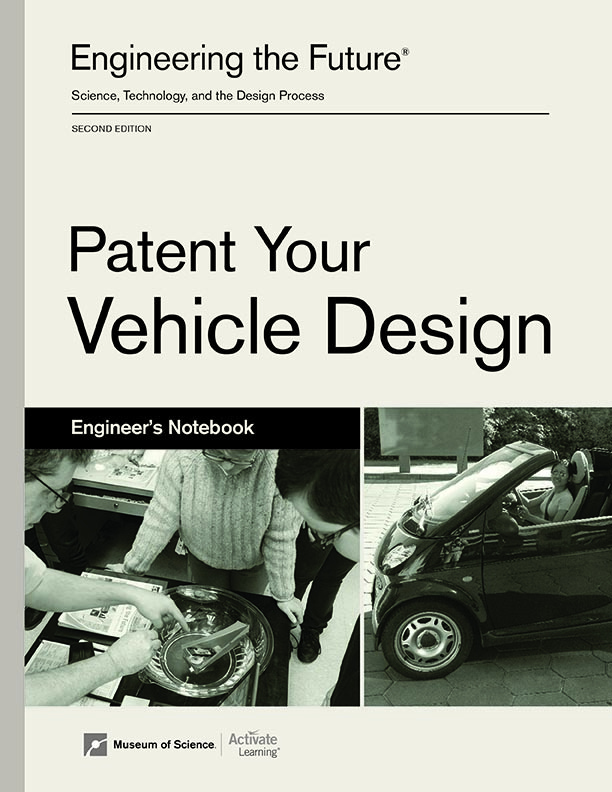 Patent Your Vehicle Design begins with construction of a power steamboat, consistent with the “maker” approach and using a variety of hand tools and assembly techniques; but with the important addition of an inquiry process to figure out how it works through reverse engineering. And, as in the first edition, the students conduct a series of activities in hydraulics and pneumatics to learn how energy is transformed in heat engines and through various devices such as pneumatic pumps and hydraulic lifts. In contrast to the first edition, the culminating project provides much greater latitude for the teacher and students to apply what they learned to reverse engineer and improve a different transportation toy (such as a model plane or car). 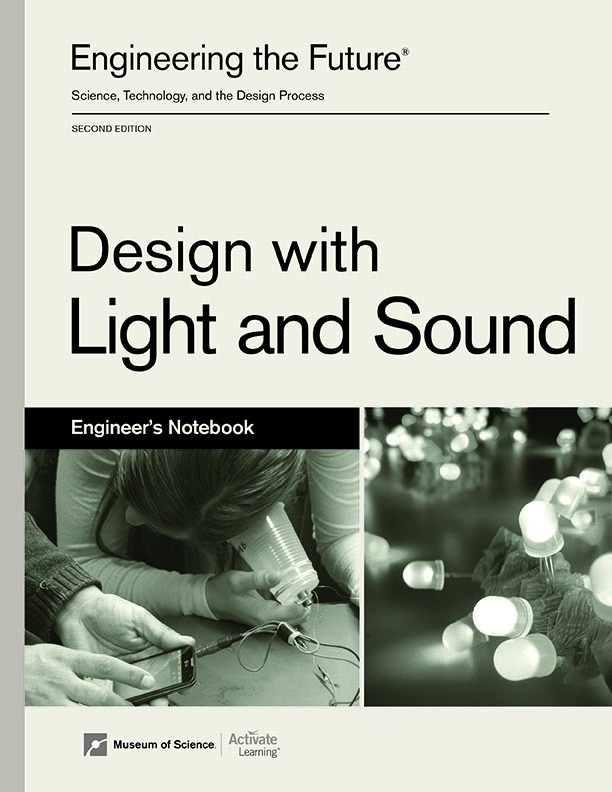 Design With Light and Sound is significantly revised from the prior edition, while preserving several of the activities that were most engaging and informative to help students develop an adequate mental model of electricity. The new activities follow the constructivist “maker” theme to engage students in much deeper understanding of electricity and communications. Students begin the project with an exposure to basic electricity and electronic construction by inventing and making their own “LED gadgets” to learn the basics of electricity. This is followed with an introduction to sustainable energy sources such as wind and solar. The importance of energy storage is highlighted by students making their own emergency batteries from household materials. The project closes with electromagnetism, waves and communications, and the opportunity for students to design audio speaker systems and make FM radios to play music. EtF Project Director, is Associate Research Professor at Portland State University in Portland, Oregon, where he teaches courses in research methodology in a Master of Science Teaching degree program and co-directs two grant projects. He serves as a consultant to two philanthropic foundations and chairs a committee for the National Academy of Engineering. He was the lead consultant in engineering to the National Research Council for A Framework for K–12 Science Education, and served in a similar role on the writing team for the Next Generation Science Standards. Dr. Sneider taught science in Maine, Costa Rica, Coalinga California, and the Federated States of Micronesia. He subsequently worked for 28 years at Lawrence Hall of Science, University of California, Berkeley, where he was Director of Astronomy and Physics Education. He then moved to Boston to become Vice President for Programs at the Museum of Science. In 2011, he was appointed to the National Assessment Governing Board, which sets policy for “The Nation’s Report Card.” Dr. Sneider earned a bachelor’s degree in Astronomy at Harvard College, and doctoral degree in Science Education at UC Berkeley. is a high school mathematics teacher at the Arlington Public schools in Arlington, Massachusetts. Dr. Bunn’s teaching experience ranges from sixth grade through the university level and includes serving as on-camera instructor for five books published by Addison Wesley for college level introductory mathematics. She has also conducted professional development sessions on science, technology, engineering, and mathematics in more than a dozen states and online. She served on the Technology-Engineering Advisory Council and the Technology-Engineering Assessment Development Committee for the Commonwealth of Massachusetts. Additionally, she has worked as an author, editor, and content consultant for Kaplan, Houghton-Mifflin, It’s About Time, and Pearson Education. Dr. Bunn earned a bachelor’s degree in engineering, a master’s degree in secondary education, and a doctoral degree in curriculum and teaching from Boston University. 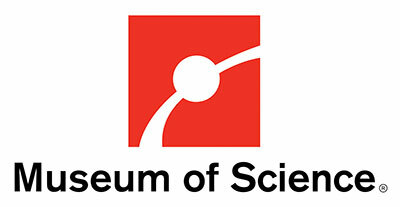 is a curriculum writer and professional developer for the Museum of Science, Boston where he also moderates a teacher support site for over 500 EtF teachers. From 1996 to 2006, he served as Senior Scientist, NSF Principal Investigator, and Project Director on several federal grant and corporate client funded research-based curriculum projects at TERC in Cambridge, MA. Prior to that, he was Assistant Dean of Technical Education and Division Chair at Ozarks Technical Community College in Springfield, MO, Department Co-Chair at Indian Hills Community College in Ottumwa, IA, president of an industrial supply and motor rewinding service, and Environmental Division Supervisor for a major power plant architect-engineering firm. Mr. Pulis earned a bachelor’s degree in Biology from Dartmouth College and a master’s degree in Ecology and Systematics from Cornell University. is a noted technologist and educator in electronic system design and STEM education. He has been an invited faculty at leading institutions in the U.S. and Asia to collaborate on design-centric learning approaches. He is currently a research faculty at Portland State University’s College of Engineering in Oregon, leading a Lemelson Foundation project on design and invention in high school science curricula. He also continues as a Distinguished Research Scientist at Olin College of Engineering, where he helped develop the Affordable Design and Entrepreneurship program. Prior to his focus on education, Mr. Ravel’s corporate career spanned three decades of leading high-tech R&D organizations. He served as Vice-President of Technology for National Instruments, a global pioneer in computer-based automation, control, and system design, and as a Corporate Fellow and Director of Strategic Technologies for Tektronix, a global leader in high performance instrumentation and electronic design. Mr. Ravel earned a bachelor’s degree in Physics, Electrical Engineering and Computer Science from the Massachusetts Institute of Technology, and has advanced graduate studies in semiconductors, digital communications, optics, neural networks, and electronic design from various universities.